See below for individual announcements or click here for a pdf version. The accountant will ensure that all financial transactions are properly accounted, records well maintained and bookkeeping done in accordance with the Liberia Annual Conference of the United Methodist Church (LAC/UMC) and Global Ministries guidelines and procedures. Ensure all financial documents are complete, marked before filing and entering into the accounting system. Ensure all financial vouchers and receipts are recorded into the accounting system (QuickBooks) on a daily basis. Ensure all transactions are adequately supported and appropriately signed and recorded on voucher. Reconcile cash book balance with actual cash count and investigate any discrepancies on a weekly basis. Perform monthly bank reconciliations to reconcile bank balances and cash book for all LAC/UMC and Global Ministries accounts. Receive and review expense reports from various projects, departments and mission stations for consistency with disbursements made. Ensure internal controls are adhered to in line with Liberia Annual Conference and Global Ministries guidelines and procedures. Provide weekly update budget reports to the conference treasurer. Manage the Liberia Annual Conference day to day accounting functions and timely submission of budget/actual reports to the conference treasurer. Assist in preparing for and during internal and external audit. Maintain up-to-date and accurate accounting system. Receive cash from bank, projects, donors, lessees for immediate deposit in to the relevant bank account. Perform conversion of local currency as instructed by the conference treasurer through the bank or authorized foreign exchange medium. Perform other duties as assigned by the conference treasurer. NOTE: Only short-listed applicant(s) will be contacted. The business manager will handle the day to day operation of the Liberia Annual Conference office and assist with the treasury functions where necessary. The data entry and filing clerk will support the functions of the Liberia Annual Conference of the United Methodist Church treasury with data entry and filing activities. He/She will work closely with the accountant and business manager. Assist with the handling and reviewing of expense reports from the projects, departments, mission stations, etc. REV. DR. JULIUS SARWOLO NELSON, JR.
And I thank God for the storms he brought me through. IN THE MORNING, YOU ARE GOD. IN THE AFTERNOON, YOU ARE GOD. IN THE EVENING, WHEN WE FORGET ABOUT YOU, EVEN AT THE TIME, YOU ARE GOD JUST BY YOURSELF. SPEAK TO ME IN SPITE OF ME AND LET THE WORDS OF MY MOUTH AND THE MEDITATIONS OF OUR HEARTS, BE ACCEPTABLE IN YOUR SIGHT; O, LORD, OUR ROCK, REFUGE, REDEEMER AND RISEN SAVIOR. AMEN. ‘No one can please God without faith, for whosoever comes to God must have faith that God exists and rewards those who seek him…’ Amen. The word “ANCHOR” comes from the Greek word ‘ANKURA’. As a Noun, it is a heavy metal or object used to “MOOR OR MAKE FAST” OR SECURE IN A WAY a ship at the bottom of the sea. As a Verb, it is something fix firmly in a position. As a noun, FAITH (according to Hebrews 11:1) is the substance of things hope for, the evidence of things not seen. Faith is the confidence that someone or something is RELIABLE. Our whole life is based on faith and believing. Our journey is filled with trusting banks, post offices, cars, homes, beds, hospitals, clinics, supermarket, etc. As a verb, it is to believe. Salvation is free and it is believing in Christ Jesus by Grace and not by works. We must believe that God says according to the writers of the scripture/word. But this believing is also challenging each of us to decide either for or against Jesus Christ and his offer of Salvation. The Book of Hebrews, chapter eleven verses four to forty (Hebrews 11:4-40) gives us a litany of those whose faith were anchored in God, THE ARCHITECT, BUILDER, CREATOR, PROVIDER, SUSTAINER, RESCUER, LIBERATOR, REDEEMER, SAVIOR AND COMFORTER. You can do the same today by anchoring your FAITH IN GOD who is always able and faithful. Hebrews 11:4-40 informs us about fathers and mothers; brothers and sisters and children who anchored their FAITH IN ALMIGHTY GOD: Abel, Enoch, Noah, Abraham, Sarah, Hagar, Isaac Jacob, Esau, Joseph, Moses, Joshua, David, Solomon, Samuel, Daniel, Isaiah, Jeremiah Nehemiah, Shadrack, Meshack and Abinedigo, Ruth, Naomi, Esther, etc. Bishop Stephen Trowen Nagbe, Sr. I am so grateful, so mighty grateful. THAT’S WHY I AM GRATEFUL, SO MIGHTY GRATEFUL. SO REJOICE, YOUR STEPS ARE ORDERED BY GOD. It is in these times as we journey to the next fifty years that each of us will need a SAVIOR, BIBLE, ROCK, FRIEND, and AN ANCHOR. LET YOUR ANCHOR HOLD AND GRIP THE SOLID ROCK. THIS ROCK IS JESUS, THE ONLY ONE. BE VERY SURE. I AM VERY SURE. LET YOUR ANCHOR OF FAITH BE IN GOD, THE ALMIGHTY, MERCIFUL AND PRESERVER OF OUR FAITH ESPECIALLY OUR SPIRITUAL JOURNEY IN THE WHOLE INHABITED EARTH. TO GOD BE THE GLORY. IN THE NAME OF GOD THE COMFORTER, AMEN. Grace and peace to you from the Liberia Episcopal Area. As we commemorate this year’s International Women’s Day, it is very important for the Church to recognize the many sacrifices and contributions women have made and continue to make to the Church, Society, and the worldwide community. I am deeply grateful to our mothers, aunts, wives, sisters and daughters for their inspiration and hard work to move our Church forward. We know there are many discriminatory practices in our society against women. We need to genuinely work to remove all barriers so that we can have a more inclusive and prosperous society. Women are important to the family. Women care for, nurture, and work hard for children to become successful and responsible citizens. In our Churches and Districts, the most vibrant organizations are women’s organizations. As a Church, we should be the example of inclusiveness. The United Methodist Church will continue to support and empower women. I urge us all to eliminate those vices that have created divisions in our society. I am therefore dedicating the Month of March to all women, and calling on all United Methodists in the Liberia Episcopal Area to commence all celebrations in our schools, Churches and Districts, and end on/before March 31, 2017. In every United Methodist learning institution, I am directing that appropriate school-wide assemblies and/or devotions are held to discuss and highlight the work and achievements of women in our society with the focus on what students, parents, school administrators, and others must do to be respectful and appreciative of women. Celebrating is only a first step, but we should create the conducive environments that will perpetuate the supportive setting for girls and women to thrive- free from all forms of harassment such as sexual favors, coercion to do favors that are not acceptable in Christian settings. Churches should engage in worship services through teaching and preaching for all United Methodists to know, understand, and feel that our collective responsibility to women is not lip service. We need our clergy to foster, support and lead our congregations in ways that demonstrate to our mothers, aunts, wives, sisters, and daughters they are partners in everything we do. We recall the faithful witness of Sarah, Rebecca, Hannah, and Mary of the Bible, as well as, the historic women such as Susannah Wesley and others, who led the struggle for social justice in Liberia and around the world. Fellow United Methodists, our dedication of the month of March to women should be a new beginning that is manifested not only by words, but commitment to all girls and women throughout the Liberia Episcopal Area. United together for a common purpose, we will together overcome barriers that our women are facing today. Rev. Dr. Samuel J. Quire, Jr. The United Methodist Church in Liberia meeting in its 184th Annual Session voted no to amendments numbers one and two and voted yes to amendments numbers three, four, and five on Saturday, February 18, 2017. In an hour-long discussion led by the now former Conference Lay Leader, Rudolph Merab and two consultants, Rev. Dr. Jerry Kulah and Rev. Dr. Julius Nelson, members of the conference voted amendments one and two down because the African delegates to the 2016 General Conference had earlier voted them down. Leading the voting process, the Rev. Dr. Jerry Kulah said the characterization of God without a gender is the basis for voting down amendment one. He said as a conference we believe men and women are of equal value in the eyes of God, adding, “We think by changing the character of God into a genderless character which this amendment is seeking to do is not scriptural. Though the General Conference approved the measure by a vote of 746 to 56, the Liberian church voted it down with 956 “No” votes representing the entire membership of the conference in attendance. Amendment two was voted down with 954 “No” votes with two conference members abstaining from the process. Asked if she endorses the conference decision to vote down the amendment which declares that “men and women are of equal value in the eyes of God,” Yatta Young, Dean of the Master of Divinity program at the United Methodist University said the decision is intended to strengthen the masculine concept of the African men. “I can only address God as Him because of convenience,” Young said. The United Methodist educator said the characteristic of God is neither male nor female and as such the church should find a way that will not be offensive to some women because God is addressed as father. The 184th Annual Session also voted overwhelmingly to approve amendments 3, 4, and 5 as changes that need to be affected by the General Conference in the new UMC Book of Discipline. Amendment three addresses the issue of the elections of delegates to General, jurisdictional and central conferences and was discussed at length and was later endorsed with a 952 “Yes” votes, two “No” votes, with two conference members abstaining from the process. Alfred Kwabena Mensah, a young adult who voted against the amendment said approving such amendment will the undermine the ability of [specific organizations] to be represented by their leadership. “What will the presidents do when they are not elected by their organizations to the various conferences,” Mensah asked? The Ganta gathering of the United Methodist Church in Liberia adopted a budget of 1.7 million United States dollars for the 2017 Conference Year. The execution of the budget will now be managed by the Conference Council on Finance and Administration (CCF&A) along with the representative of the Area Finance Executive from the General Board of Global Ministries of the United Methodist Church. As part of its general resolutions, the 184th Annual Session approved Bishop Samuel J. Quire, Jr recommendation naming an endowment fund in honor of President Ellen Johnson Sirleaf to support girl education. “The endowment fund will seek to remove girls from the streets and place them into good institutions of learning,” Bishop Quire concluded. The 184th Annual Session of the United Methodist Church in Liberia was attended by 554 clergy members 402 lay members in Ganta City, Nimba County, northern Liberia. (L-R) Bishop Samuel J. Quire, Jr. & Retired Bishop Arthur F. Kulah at the head of the conference table at UMC Liberia 184th Annual Session. Ganta United Methodist School Gym. Host site of the LAC 2017. More photos by E. Julu Swen from the LAC gathered at Ganta UMS. One of the feeding stations at the 184th Annual Session of UMC Liberia. Delegates waiting to be served. The new bishop of the Liberia Annual Conference opened his first Annual Conference today in Ganta City, Nimba County, Liberia. He is calling on United Methodists of Liberia to return to their roots as Wesleyans and seek to grow in their spiritual life. Delivering his Episcopal Address to the 184th Annual Session of the Liberia Annual Conference in Ganta City, Nimba County, Bishop Quire indicated that he will encourage pastors to meet in small groups to pray, study the Word, and strengthen one another. “When pastors are spiritually strong, they will become efficient evangelists,” he emphasized. The Resident Bishop also indicated that he is going to mandate the Department of Missions and Evangelism to produce satisfactory conversion based discipleship making throughout the fifteen (15) counties of Liberia. He told fellow United Methodist attending the conference that Wesleyan renewals need to take over the districts and the churches in Liberia. He further said a church without spiritual renewal of the soul is a dead church, adding, “Our members’ spiritual growth and consciousness must be enhanced throughout the Conference.” Bishop Quire cautioned that the nature of his episcopal leadership will be pastoral. Commenting on the corporate status of the church, Bishop Quire reiterated earlier called for the properties of the church to be located, cataloged, and appropriately documented legally. “We will review existing properties contracts signed for and on behalf of the church to ensure legal compliance,” he asserted. 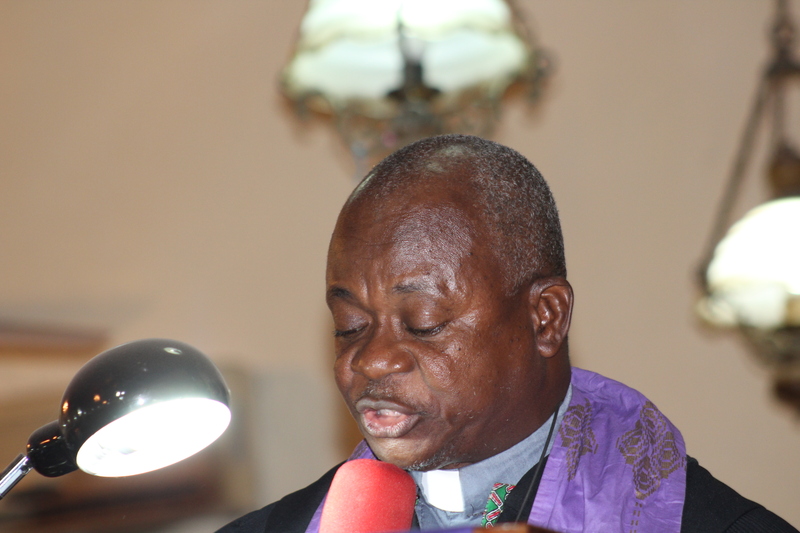 The clergyman said the United Methodist Church in Liberia cannot overlook the need for financial sustainability, adding, “we may need to call upon our international partners for advice concerning economic development initiatives within our conference.” Bishop Quire named agriculture as the key factor that will facilitate sustainability in the church. Bishop Quire addressed the Liberia Annual Conference on Wednesday, February 15, 2017. This week, we have gathered for the 184th Session of the Liberia Annual Conference. It is a blessing and an honor to stand before you as the presiding Bishop prepared to move our annual conference into the future. Today, we look at the past and extend gratitude to Retired Bishop Arthur F. Kulah, who led the Church during the turbulent years of the war and remained steadfast as a prophetic and pastoral leader. Through his leadership, the Conference continued its ministry to United Methodists who found themselves uprooted to parts of West Africa, extending the mission to Guinea, the Ivory Coast, and Ghana, providing spiritual nurture through various ministries in these countries. In Liberia, Bishop Kulah remained vocal and worked tirelessly during the peace process and with the Truth and Reconciliation Commission. His visionary leadership not only expanded the mission of the Conference beyond our borders, he was instrumental in establishing the radio station, the United Methodist University, maintaining a strong connection with our partners, and preserving a vibrant conference presence in Liberia. We also extend warm appreciation to Retired Bishop John G. Innis who continued the progress Bishop Kulah initiated. Bishop Innis did so by enhancing human capacity through providing scholarships for many Liberians to obtain their Master and Doctorate degrees in theology and other disciplines. He worked tirelessly to move the Church in the 21st century through the establishment of mission stations, schools, clinics and health centers. I am also grateful for the opportunity provided me to pursue my graduate studies and to work with the Church at the highest level during Bishop Innis’ Episcopacy. As I begin my Episcopacy to lead our great Church forward into this 21st century, the future that God has stored for us will be realized in our time. Together, we continue the march forward, marching and preaching, and making disciples. My brothers and sisters in Christ, the nature of my Episcopacy will be pastoral. From the inception of my ministry, I was called to be primarily a pastor who listens and one who seeks spiritual dialogue and discussion. The future beckons. For over 184 years, The United Methodist Church has been in mission to the people of Liberia. We want to continue that mission with the support of every member of this Conference. In Romans 12, Paul writes, “For just as each of us has one body with many members, and these members do not all have the same function, so in Christ, we, though many, form one body, and each member belongs to all the others” (NIV). In this light, I extend a warm hand of fellowship to every United Methodist in this country and around the world through the connectional system and the tie of Christ’s love that binds us. Let us move forward with faith into the future, because the mission of Christ is still as urgent as it was when He first launched His own ministry and passed it on to the disciples through the Great Commission. The urgency of Christ’s mission and ministry remains strong because we are still called upon “to proclaim Good News to the poor, proclaim freedom for the prisoners, recovery of sight for the blind, set the captives free, and proclaim the year of the Lord’s favor” as Jesus himself described His ministry in Luke 4:18-19. We cannot expect to make progress if we remain in the same mindsets with the same attitudes. We need a new paradigm shift in the Liberia Annual Conference of The United Methodist Church. We need young minds to move the Church forward. My fellow United Methodists and Friends, our Episcopacy will work on ensuring that the Church continues its primary focus on missions and evangelism, education, and health, as well as, venture into new terrains that will benefit and prosper the Church. For us to focus on the latter, this is the time to begin thinking about ways that will make the Church less dependent on others. I know we are capable and able, if we sincerely work together. The Almighty God, our Heavenly Father has blessed us with good soil for us to sow seeds that would bring great benefits to the Church through transparent commercial economic development. Now is the time, and this is the season. As a Church, Missions and Evangelism, remain the primary purpose of our work. The Department of Missions and Evangelism should function effectively not only at the conference level but also within the various districts and local churches. I am directing the Department of Missions and Evangelism to produce satisfactory result of conversion and discipleship. This means, the work of the Department should extend throughout the fifteen counties. I would like to initiate a ministry of spiritual counseling for pastors and their families. I would also like to encourage the Wesleyan class group where pastors can meet in small groups to pray, study the Word, encourage and strengthen one another. When pastors are spiritually strong, they will become efficient evangelists. We need to see Wesleyan renewals taking over in our districts and churches. A church without spiritual renewal of the soul is a dead church. Our members’ spiritual growth and consciousness must be enhanced throughout the Conference. On the district level, I am directing all District Superintendents to cultivate the ability to think creatively and adapt evidence-based practices to evangelize and increase the number of United Methodists. Districts can conduct training to empower and equip the various ministries such as the Diaconal (Deaconesses), the Children, the Aging (Elderly), the United Methodist Men, the United Methodist Women, the United Methodist Youth, and the United Methodist Young Adult Fellowship. The Conference will be available to provide resources that districts and local churches can utilize. I urge the Department of Missions and Evangelism to visit every district quarterly to support their evangelistic and discipleship efforts. God desires for us to grow spiritually, and He has given us all we need to experience spiritual growth. My Brothers and sisters in Christ, since the 19th century, The United Methodist Church of Liberia has been actively involved as a pioneer in the delivery of quality education in Liberia. From the Monrovia Seminary, which became the College of West Africa to the Cape Palmas Seminary, our educational institutions have educated many of the Liberian leaders who served this country, Africa and the rest of the world. Since the inception of United Methodist education in Liberia, the purpose has always been to proclaim Jesus as Lord of all, to let the image of God in each person become more distinct, to produce people of Gospel principles, to form people with virtue and values, to offer knowledge and skills, to increase human capacity and to empower people as they become more actualized. Our education has also been for nation building, community development, and for social transformation. We are steadily progressing into the 21st century and the same question the Church had to address when educational institutions were first established is the same one we must address today. Education for what? In other words, what is the role of United Methodist education in the socio-economic development of Liberia? Africa? the World? The world we now live in is connected by technology and threatened by extremism. It is a world in which our students should be able to compete with other students around the world. The boundaries that once existed have virtually vanished due to technological advancements and we must ensure that the appropriate environments do exist in our churches, schools and communities. The education we offer should produce professionals with principles; these professionals should create an environment where development and progress are constant, where it is conducive for business while maintaining human dignity. Almost every United Methodist local church has a school connected to it, many have become secondary schools. The General Board of Education and Ministry, working closely with the United Methodist University, must ensure that there is uniformity of quality among all United Methodist learning institutions. It is not enough to have a few schools relishing in accolades of academic excellence while others struggle to meet basic academic standards. We must all join hands to elevate the standards of all our schools. The General Board of Education and Ministry, the United Methodist University, and the leadership of our secondary schools must develop a relationship that will ensure quality education is evident in every United Methodist institution of learning. These institutions of learning must prepare students for college with a solid foundation that begins as early as pre-school and kindergarten. As I discussed in my inaugural address on December 31, 2016, the need for the Church to have vocation technical education institutions to meet the needs of our students and society, cannot be over-emphasized. I am asking the General Board of Education and Ministry, the United Methodist University, and our partners, to come up with a blueprint before our next Annual Conference. We need to quickly establish new quality technical vocation education programs in specialized areas of electricity, plumbing, carpentry, masonry, among others, to support the socio-economic development goals of Liberia. It would even be beneficial if some of our existing secondary schools were transformed to have magnet programs, for example, science and technology, agriculture, biotechnology, among others. I have asked my wife, Mother Richlain K. Quire, to begin her initial work with our rural United Methodist Communities. She will collaborate with the General Board of Education and Ministry to provide Life Skills trainings to rural pastors’ wives and other United Methodists that need assistance to become self-productive and contributing members of the society. My brothers and sisters in Christ, the challenges in our health care delivery systems are enormous. We, as a Church, should continue to assist Government in providing affordable and quality healthcare delivery services to our people. There are those who believe health is everything. I agree and believe that a healthy society is a productive society. We have all seen how the Ebola epidemic shut our social institutions down, forcing our society to come to a halt. Jesus is a Healer who restores health to those who ask him. We must make healthcare a priority. This means the continuous support of the Ganta United Methodist Hospital, and all our healthcare centers and clinics. The United Methodist University through its College of Health Science should partner with the Ganta United Methodist Hospital and the Liberia Annual Conference Department of Health to provide and promote quality healthcare prevention programs throughout the Conference. The Church must also continue to support the existing healthcare centers and clinics with qualified healthcare professionals and medical doctors, while ensuring that those districts without any healthcare facility begin to have access to health centers and clinics. As we venture into other areas of investments to grow and prosper the Conference, it is important for us to take a look at the various assets of the Conference. I am directing the Board of Trustees to immediately locate and catalog all conference properties. The Board of Trustees, working along with the Office of the Chancellor, will ensure that all conference properties donated and/or acquired have the appropriate legal documents. Further, all existing properties under lease are to be reviewed to ensure compliance. We cannot overlook the need for financial sustainability. We may need to call upon our International Partners for advice concerning economic development initiatives within our Conference. Developing economic resources can take place not only on the conference level but in the various districts and local churches as well. We must strive for economic viability. Economic viability means sustaining our Church with projected revenues from other sources outside the Church. Church’s revenue must be greater than or equal to all current and planned expenditures. Earlier, I mentioned that the Church needs young minds for us to grow and become responsive to the concerns and cry of our brothers and sisters. One way to respond is through intentional agriculture initiatives and programs. We are blessed as a people with rich soil. I believe the Church needs to engage in cash crops and food production. This way, we will be able to support our pastors, churches and conference, and become less reliant on aid. PASTORS SHOULD NOT BEG FOR BREAD. We are going to revitalize the Agriculture Department of the conference. The Agriculture Department will ensure that the Conference has cash crops (coffee, cocoa, palm), and food production (animal husbandry, vegetables, and aquaculture) farms. The specific geographical location will be based on the advice of the experts. The conference cash crop programs will be managed under the Office called The United Methodist Rural and Agricultural Development Program (UMRADP). UMRADP will also work on the revitalization of all local Churches and Districts Agricultural Sub-Committees; and develop programs, as well as, coordinate and provide technical support to districts, local churches and school base agricultural programs. Again, the United Methodist University College of Agriculture and the Conference Agriculture Department should work together for the realization of these goals. The Conference will continue to explore investment opportunities such as (credit union, insurance, housing, etc.). In these areas, many lay people will be trained in various managerial programs to manage what the Church will decide to venture into as investment for self-sustainability. However, it is expected that those districts and churches that are currently economically viable, should begin to look at business investment opportunities that will support the church and district. Moreover, I would like to see the Liberia United Methodist Endowment Foundation (LUMEF) which was launched by Bishop Innis, be more proactive in their support of the districts and local churches economic development initiatives. There is an urgent need to strengthen the various institutions of the Conference. As such, there will be intentional monitoring and evaluation framework to ensure efficiency, effectiveness, relevance, accountability and sustainability throughout the conference. We will work on the creation of a merit system within the Conference based on Christian character (spirit-filled life), education, competence and experience. It would certainly be great, if the resources were available for us to standardize the salary and benefits of all personnel, most especially, our pastors based on education, longevity and tenure. Part of the strengthening of our organization is for us to have discussions around ways the Conference can support all districts and explore ways to decentralize administrative structures. This week, as we convene the 184th Session of the Liberia Annual Conference of The United Methodist Church, we have all gathered to hear the reports from our colleagues. I am excited, as the Bishop, to listen to the progress of the tasks assigned and how the tasks were implemented and completed with the talents, gifts and graces God has given us. Truly, the love of God has brought us a mighty long way. My ministry has been stable and consistent, faithful to Christ and exercising all humility, shown great respect for all. As we look to the future, I recall the words of Paul to the Philippians 4:8, “Finally, brothers and sisters, whatever is true, whatever is noble, whatever is right, whatever is pure, whatever is lovely, whatever is admirable–if anything is excellent or praiseworthy–think about such things” (NIV). This is what we want to do. Please keep praying for me and my family, as I strive to do the Lord’s will in Missions and Evangelism, Education, Health, and Economic Development; And on the Spiritual Growth and Development, the Mission of the Faith, the wellbeing of the Community of Faith, and Pastoral Support and Capacity. “With God, all things are possible” (Matthew 19:26). At this convening of our 184th Annual Conference, my brothers and sisters in Christ, I hope and pray that the Holy Spirit will continue to motivate all of us to remain faithful to Christ as we strive to fulfill His mission. May God bless us and prosper the works of our hands. Welcome to LAC 2017. 184th Session at Ganta United Methodist Mission Station, Ganta City, Nimba County, Liberia. “A Future with Hope” Jeremiah 29:11 and Romans 5:1-6. February 13-19, 2017. Photos from the Liberia Annual Conference gathered in Ganta City, Liberia. BASIC FUNCTION: Serves as the Treasurer of the denominational headquarters of The United Methodist Church in Liberia overseeing all financial matters. WORKS WITH: Annual Conference Staff, Cabinet, Trustees, Liberia, and other Conference officials & committees. Facilitate the safeguarding of the church’s finances in consultation with the CCF&A. Receive and disburse, according to annual conference action and the policy of CCF&A, conference funding. Administration of payroll and payroll related functions. Ensure that bank balances and payments are reconciled to bank statement on a monthly basis. Prepare annual financial report and ensure professional audit of all conference accounting records. Issue monthly financial reports to the CCFA and Bishop’s office. Prepare the CCF&A report to Annual Conference. Other duties as may be assigned by CCF&A. All qualified and interested applicants can submit their CVs with three references, one of which should be your current pastor along with a cover letter. Applications can be submitted to the email address below with position title on the subject line. ccfa.lac.umc@gmail.com. Deadline: January 30, 2017 at 5:00 pm. Please note that only short listed applicants will be contacted and females are strongly encouraged to apply.